After intensive, long-term musical training, the auditory system of a musician is specifically tuned to perceive musical sounds. We wished to find out whether a musician's auditory system also develops increased sensitivity to any sound of everyday life, experiencing them as noise. For this purpose, an online survey, including questionnaires on noise sensitivity, musical background, and listening tests for assessing musical aptitude, was administered to 197 participants in Finland and Italy. Subjective noise sensitivity (assessed with the Weinstein's Noise Sensitivity Scale) was analyzed for associations with musicianship, musical aptitude, weekly time spent listening to music, and the importance of music in each person's life (or music importance). Subjects were divided into three groups according to their musical expertise: Nonmusicians (N = 103), amateur musicians (N = 44), and professional musicians (N = 50). The results showed that noise sensitivity did not depend on musical expertise or performance on musicality tests or the amount of active (attentive) listening to music. In contrast, it was associated with daily passive listening to music, so that individuals with higher noise sensitivity spent less time in passive (background) listening to music than those with lower sensitivity to noise. Furthermore, noise-sensitive respondents rated music as less important in their life than did individuals with lower sensitivity to noise. The results demonstrate that the special sensitivity of the auditory system derived from musical training does not lead to increased irritability from unwanted sounds. However, the disposition to tolerate contingent musical backgrounds in everyday life depends on the individual's noise sensitivity. To our knowledge, only one study has investigated the relationship between noise sensitivity, musical background, and experience. Franek  found that individuals who played any musical instrument or had played in the past had slightly higher levels of noise sensitivity than people who never played a musical instrument but who liked to listen to music. In that study, subjects who did not listen to background music very frequently and those who preferred complex and reflective musical genres had slightly higher levels of noise sensitivity. However, listening to music and instrumental training/practice are different components of musical behavior; hence, they may or may not relate to noise sensitivity independently from each other. Musical behavior as a complex phenomenon should be studied by investigating several main components of it, such as the importance of music, musical aptitude, amount of training/practice, and listening to music, which can also be viewed as time spent in passive (background) and active (attentive) music listening. Taking into consideration various details of musical behavior may bring forth new evidence on the relationship between individual noise sensitivity and musical behavior. Hence, this study aims to investigate whether music listening, training, and aptitude increase general sensitivity to environmental sounds, resulting in altered noise sensitivity in musicians compared to nonmusicians, and overall whether and how musical behavior and attitude relate to noise sensitivity. (M) = 28.57, standard deviation (SD) = 7.93 for Finland; M = 24.71, SD = 8.01 for Italy]. The recruited subjects also participated in other studies on brain determinants of music perception and appreciation (Finland), and language learning (Italy). The results of these studies will be reported elsewhere. The subjects were classified into three groups according to their musical expertise, similar to previous studies (e.g., Tervaniemi et al. 2006; Brattico et al. 2009; Vuust et al. 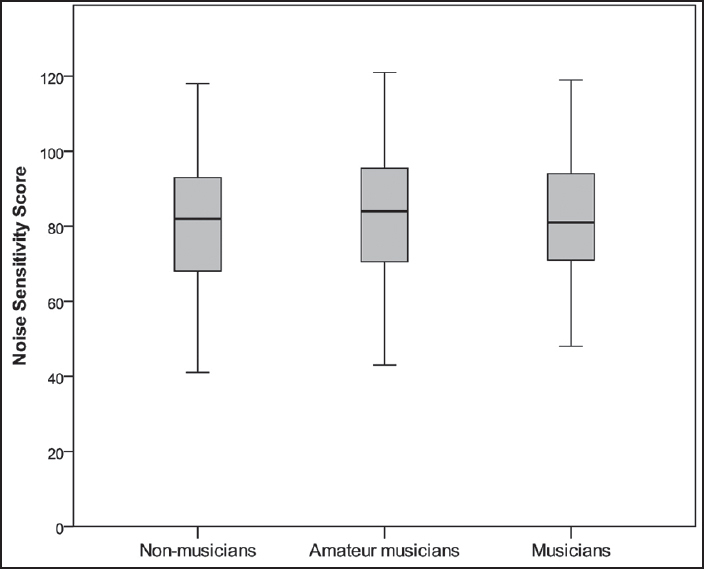 2012): Nonmusicians (N = 103), amateurs (N = 44), and professional musicians (N = 50). , Nonmusicians were the individuals who never played any music outside regular school, or had a little practice that was not recent. Amateur musicians were musically trained individuals who were self-taught or did not graduate from a music school, and had weekly practice. Professional musicians had attended music lessons for more than 5 years, practiced an instrument or sang regularly, and earned money from music teaching and/or performance. The study was approved by the local Ethical Committees at the University of Helsinki and the University of Foggia and it conformed to the Declaration of Helsinki. Written informed consent was obtained from all subjects. The Finnish subjects were not paid for their participation in the study but a small compensation was provided for the time spent, or travel expenses were offered in the form of culture passes (value of €15). For the Italian subjects, participation in the study was part of the study credits for the Psychology curriculum. Subjects were invited to fill in the Helsinki Inventory of Music and Affective Behaviors (HIMAB) online. The HIMAB is an Internet-based test battery that includes listening tests for the evaluation of individual musical aptitude; questions assessing training history; level of musical training; yearly and weekly amount of musical practice; weekly music listening; and noise sensitivity. HIMAB was provided in Finnish, Italian, and English, to be filled in depending on the language preferred by each individual subject. The test included a list of questions and links. The links directed participants to sound tracks or an external website where they could fill in online musical aptitude tests. In Finland, after recruitment, and upon informed consent, subjects were sent an email containing instructions and link to the online form that they could fill in at home or in the lab, as they wished. When subjects filled in the HIMAB at home, they were given the telephone number of a research assistant who would guide them in case any technical issues arose during the experimental session. In Italy, informed consent was collected from the participants during a Psychology course. Students were invited to fill in the HIMAB in the lab of the Department on different days. HIMAB questions on musical background were adapted from the "Creativity in Music" questionnaire. The questions assessed subjects' musical education, duration of musical training, age of musical training onset, and amount of weekly practice. These variables were collected to affiliate subjects to a musical group and were not analyzed for association with noise sensitivity. Another set of questions from the "Creativity in Music" questionnaire assessed the habits of listening to music at different age ranges. Listening to music was qualified in hours per week spent listening passively (e.g., background music) or actively (directed listening, without doing anything else). For this study, we analyzed only the amounts of listening to music at the subjects' current age. Another HIMAB question assessed music importance:  subjects were asked to evaluate the importance of music in their daily life on the scale from 1 (not at all important) to 7 (very important). In summary, we tested the following HIMAB variables for statistical association with noise sensitivity: Active listening to music, passive listening to music, and music importance. Musical aptitude was tested with Seashore tests for pitch and time  and the Montreal Battery of Evaluation of Amusia (MBEA). The Seashore pitch and timing discrimination subtests were used to evaluate tone and time discrimination. In the pitch tests, pairs of tones were presented. The task was to say whether the second tone was higher or lower than the first one in the pair. In the time tests, again a pair of tones was given to evaluate if the second tone was longer or shorter than the first one. MBEA was designed for the diagnosis of different types of amusia by assessing musical abilities related to the processing of pitch and beat in the musical context. The original MBEA consists of six scales evaluating music perception and memory, and it requires about 2 h to complete in the lab. For our study we used the online version of MBEA,  testing musical aptitude on three scales. We chose the online MBEA because it takes only 15-30 min and can be administrated remotely on the Internet without the assistance of a researcher. The test consists of short melodies, some of which include a tone altered in pitch, which is either mistuned (MBEA Scale) or does not belong to the key (MBEA Out-of-Key). Other melodies include a time-alternated tone (MBEA Beat). The differences in noise sensitivity between countries (Italy, Finland), genders (males, females), and groups classified according to musical expertise (musicians, amateurs, nonmusicians) were tested in separate one-way analyses of variance (ANOVAs). Spearman's rho coefficient was used to test the correlations between passive/active listening to music, music importance, musical aptitude, and noise sensitivity. Noise sensitivity scores were in the range of 25-121, with a mean of 81.07 (SD = 17.6). We did not find any differences in noise sensitivity between the two countries (P = .79) [Figure 1]. In addition, men and women did not differ in the level of noise sensitivity: Neither in the general sample of subjects (P = .08), nor in Finland (P = .15) or Italy (P = .26) alone [Figure 1]. Considering this, we combined the Finnish and Italian samples for the following analyses of noise sensitivity in relation to musical expertise, musical aptitude, and listening to music. Nonmusicians, amateurs, and musicians did not differ significantly from each other in their noise sensitivity scores (P = .96) [Figure 2]. 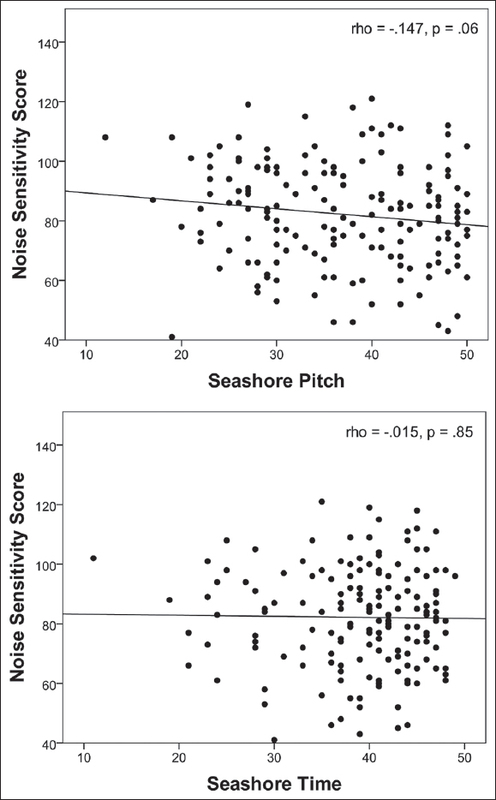 The correlation between noise sensitivity and results on the pitch subscale approached significance (rho = -.147, P = .06) [Figure 3], while no significant relationship between noise sensitivity and performance on the Seashore test for time (P = .85) [Figure 3] was found. No significant correlations between noise sensitivity and MBEA scores on any of the test subscales were observed (P = .92 for MBEA Scale; P = .57 for MBEA Beat; P = .81 for MBEA Out-of-Key) [Figure 4]. Noise sensitivity was negatively correlated with the amount of passive music listening (rho = -.243, P = .001), meaning that subjects with higher noise sensitivity use music as a background more rarely than subjects with lower noise sensitivity [Figure 5]. 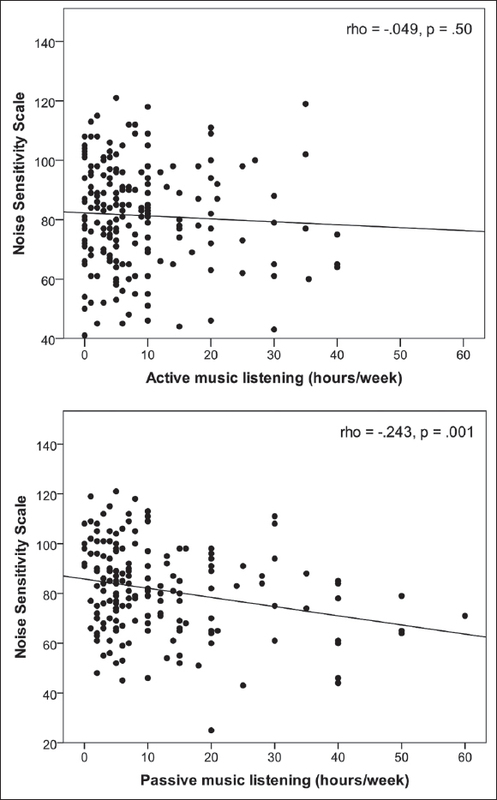 However, there was no relation between noise sensitivity and the amount of active music listening in 1 week (P = .50) [Figure 5]. 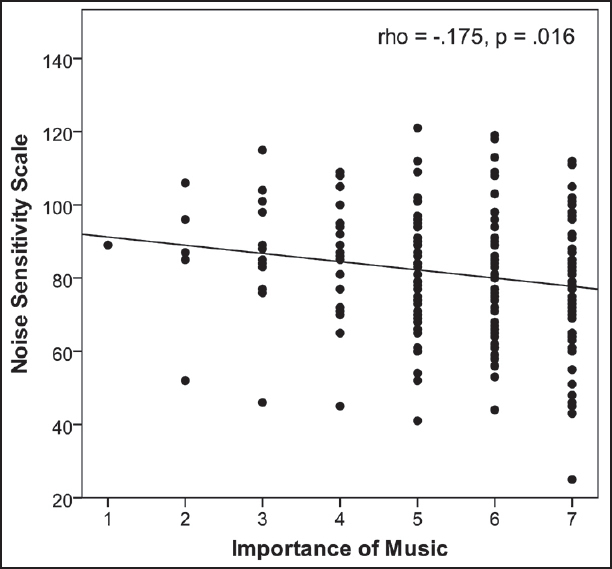 We also found that subjects with higher sensitivity to noise rated the importance of music in their life lower than those who were less sensitive to noise did [Figure 6], as was indicated by the significant negative correlation (rho = -.175, P = .016). We also found a strong positive correlation between the importance of music and amounts of passive and active listening to music (rho = .283, P = .0001 and rho = .445, P < .0001, respectively), meaning that individuals who reported music as being important in their everyday life spent more time listening to music both actively and passively. Our aim was to investigate whether noise sensitivity is associated with music listening, training, and aptitude. 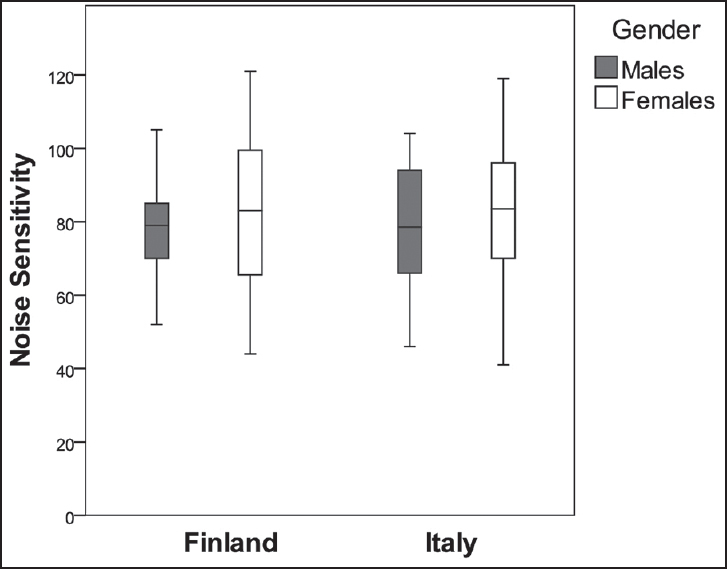 The results show that cultural differences between Italy and Finland do not moderate noise sensitivity, and neither does gender of the adult participants. Furthermore, noise sensitivity does not differ significantly between nonmusicians, amateurs, and musicians. In the tests concerning musical aptitude, we did not find significant correlations between noise sensitivity and performance on the Seashore test for pitch and time. No correlations were found between noise sensitivity and MBEA scores on any of the scales. In contrast, significant correlation tests indicated that subjects with higher noise sensitivity use music as a background less often and rate the importance of music in their lives lower than those with lower noise sensitivity. In our study, noise sensitivity did not differ between participants recruited in Finland and Italy. We also did not observe differences in noise sensitivity between male and female participants. Previously, similar levels of noise sensitivity in different countries were found in a study conducted around three international airports in Amsterdam, Sydney, and London. Gender effects on noise sensitivity were not consistent across studies, as some of them reported noise sensitivity to be independent of gender, , whereas in another case women were found to be a significant majority of individuals with high noise sensitivity. As regards the results of our study, we note that the recruited participants might not be representative for the whole population in either Finland or Italy. First, the relatively young mean ages of subjects in the samples, their high level of education, and the prevalence of female Psychology students among the Italian participants limited the generalizability of our results. Second, recruitment from a single geographical point represented a single sample and might not be common for the general population. However, our results showing that nonmusicians, amateurs, and musicians do not differ significantly from each other in their noise sensitivity are at variance with previous results. A study by Franek  found that people who have played an instrument show slightly higher levels of noise sensitivity to certain noise dimensions than people who have no playing experience but like to listen to music. Yet one should keep in mind that there are methodological differences between this study and the study of Franek. First, we used general noise sensitivity without dividing it, as Franek did, into different subscales reflecting sensitivity to special types of environmental sounds. In the Franek study, musically active individuals and those who were not interested in music showed sensitivity to different sorts of noises. We could not observe a similar effect in general noise sensitivity. Second, musical groups were categorized using a different approach. In our study, we defined musical groups according to experience in playing a musical instrument or singing and formal musical training, whereas Franek considered musical practice and listening activity taken together when defining the groups. In both studies, music listening habits were significantly related to noise sensitivity. Therefore, Franek's use of music listening for classifying musical groups could be a reason for the positive result on the relationship between noise sensitivity and playing a musical instrument, which we did not observe. However, in Franek's study, individuals who were not interested in music were also slightly more noise-sensitive. Third, Franek's study  was obtained with subjects surveyed from a single geographical location and did not consider the variety of musicianship that can be typically encountered in a population, hence limiting the external validity of the findings. Our results suggest that noise sensitivity affects only passive listening to music but does not relate to the amount of active listening to music (e.g., listening to music without doing anything else or attending musical performances). Along with that, noise sensitivity is negatively associated with the subjective importance of music in everyday life. However, the importance of music is strongly related to active listening to music as well as to passive listening to music. Taken together, the observed relationships indicate that noise sensitivity is specifically related to habits for passive listening to music, whereas reduced music importance in noise-sensitive individuals seems thus to be a consequence of lowered tolerance to background music. Listening to music is especially important compared to other leisure activities, as it serves a variety of personal needs. In the investigation by Lonsdale and North  on the reasons for listening to music, participants mentioned regulating mood, performing musical activities, recalling memories, enjoying the sound of music, interacting socially, and accompanying other activities. These reasons imply an emphasis on individuals' free will in listening to music. However, a considerable quantity of the music heard in everyday life is not chosen. When music is unwanted but still present in the environment, it might meet for certain individuals the definition of noise, thus causing negative effects, depending on individual noise sensitivity. Noise sensitivity is related to individual traits such as a desire for privacy  and introversion. In a noisy condition, introverts have reported more concentration problems and fatigue during mental processing, and are slower than extroverts. For a reading comprehension task, introverts were more negatively affected by music than extroverts, and introverts were also more negatively affected by noise. Furthermore, the performance of introverts on complex cognitive tasks, such as the Stroop test, was found to be especially worsened by noise and background music with high arousal. In the future, understanding noise sensitivity will require finding the underlying neural mechanisms that cause one individual to be more sensitive to noise than another. Nonmusicians, amateurs, and musicians did not differ significantly from each other in noise sensitivity. We did not find a clear relationship between musical aptitude, assessed by listening tests, and noise sensitivity. However, we found that noise sensitivity is associated with daily musical behavior, such as passive listening to music and the importance given to music in everyday life. Individuals with higher noise sensitivity spent less time on passive (background) listening to music than people with lower sensitivity to noise. Noise sensitivity does not correlate with the amount of active (attentive) listening to music. This study was financially supported by Centre for International Mobility (CIMO) and the Academy of Finland (project numbers 272250 and 274037), which is gratefully acknowledged. We wish to thank Brigitte Bogert, Taru Numminen-Kontti, Mikko Heimola, Emilia Tuovinen, and Nella Moisseinen for data collection. Centre for International Mobility (CIMO) and the Academy of Finland (project numbers 272250 and 274037). This research was conducted in the absence of any commercial or financial relationships that could be construed as a potential conflict of interest. Westman JC, Walterst JR. Noise and stress: A comprehensive approach. Environ Health Perspect 1981;41:291-309. Kjellberg A. Subjective, behavioral and psychophysiological effects of noise. Scand J Work Environ Health 1990;16(Suppl 1):29-38. Guski R. Psychological methods for evaluating sound quality and assessing acoustic information. Acta Acust United with Acust 1997;83:765-74. Ellermeier W, Eigenstetter M, Zimmer K. Psychoacoustic correlates of individual noise sensitivity. J Acoust Soc Am 2001;109:1464-73. Job RF. Noise sensitivity as a factor influencing human reaction to noise. Noise Health 1999;1:57-68.
van Kamp I, Job RF, Hatfield J, Haines M, Stellato RK, Stansfeld SA. The role of noise sensitivity in the noise-response relation: A comparison of three international airport studies. J Acoust Soc Am 2004;116:3471-9. Stansfeld SA. Noise, noise sensitivity and psychiatric disorder: Epidemiological and psychophysiological studies. Psychol Med 1992;(Suppl 22):1-44. Heinonen-Guzejev M, Vuorinen HS, Mussalo-Rauhamaa H, Heikkilä K, Koskenvuo M, Kaprio J. Genetic component of noise sensitivity. Twin Res Hum Genet 2005;8:245-9. Marks A, Griefahn B. Associations between noise sensitivity and sleep, subjectively evaluated sleep quality, annoyance, and performance after exposure to nocturnal traffic noise. Noise Health 2007;9:1-7. Belojevic G, Jakovljevic B, Slepcevic V. Noise and mental performance: Personality attributes and noise sensitivity. Noise Health 2003;6:77-89. Heinonen-Guzejev M, Vuorinen HS, Mussalo-Rauhamaa H, Heikkilä K, Koskenvuo M, Kaprio J. The association of noise sensitivity with coronary heart and cardiovascular mortality among Finnish adults. Sci Total Environ 2007;372:406-12. Nivison ME. The Relationship between Noise as an Experimental and Environmental Stressor, Psychological Changes, and Psychological Factors. Bergen, Norway: University of Bergen; 1992. Kishikawa H, Matsui T, Uchiyama I, Miyakawa M, Hiramatsu K, Stansfeld SA. Noise sensitivity and subjective health: Questionnaire study conducted along trunk roads in Kusatsu, Japan. Noise Health 2009;11:111-7. Pantev C, Roberts LE, Schulz M, Engelien A, Ross B. Timbre-specific enhancement of auditory cortical representations in musicians. Neuroreport 2001;12:169-74. Brattico E, Näätänen R, Tervaniemi M. Context effects on pitch perception in musicians and nonmusicians: Evidence from event-related-potential recordings. Music Percept 2001;19:199-222. Brattico E, Pallesen KJ, Varyagina O, Bailey C, Anourova I, Järvenpää M, et al. Neural discrimination of nonprototypical chords in music experts and laymen: An MEG study. J Cogn Neurosci 2008;21:2230-44. Vuust P, Pallesen KJ, Bailey C, van Zuijen TL, Gjedde A, Roepstorff A, et al. To musicians, the message is in the meter pre-attentive neuronal responses to incongruent rhythm are left-lateralized in musicians. Neuroimage 2005;24:560-4. Tervaniemi M. Musicians - Same or different? Ann N Y Acad Sci 2009;1169:151-6. Merrett DL, Wilson SJ. Music and neural plasticity. In: Rickard N, McFerran K, editors. Lifelong Engagement with Music: Benefits for Mental Health and Well-being. Hauppauge, New York, USA: Nova Science Publishers: 2012. p. 123-62. Reybrouck M, Brattico E. Neuroplasticity beyond sounds: Neural adaptations following long-term musical aesthetic experiences. Brain Sci 2015;5:69-91. Wong PC, Skoe E, Russo NM, Dees T, Kraus N. Musical experience shapes human brainstem encoding of linguistic pitch patterns. Nat Neurosci 2007;10:420-2. Parbery-Clark A, Skoe E, Kraus N. Musical experience limits the degradative effects of background noise on the neural processing of sound. J Neurosci 2009;29:14100-7. Strait DL, Parbery-Clark A, O'Connell S, Kraus N. Biological impact of preschool music classes on processing speech in noise. Dev Cogn Neurosci 2013;6:51-60. Franek M. Is Noise Sensitivity Influenced by Musical Factors? Proceedings of the 10 th Conference on Acoustic and Music: Theory and Applications. Hradec Králové, Czech Republic: University of Hradec Králové; 2009. p. 19-22. Tervaniemi M, Castaneda A, Knoll M, Uther M. Sound processing in amateur musicians and nonmusicians: Event-related potential and behavioral indices. Neuroreport 2006;17:1225-8. Vuust P, Brattico E, Seppänen M, Näätänen R, Tervaniemi M. The sound of music: DIfferentiating musicians using a fast, musical multi-feature mismatch negativity paradigm. Neuropsychologia 2012;50:1432-43. Gold BP, Frank MJ, Bogert B, Brattico E. Pleasurable music affects reinforcement learning according to the listener. Front Psychol 2013;4:541. Ukkola-Vuoti L, Kanduri C, Oikkonen J, Buck G, Blancher C, Raijas P, et al. Genome-wide copy number variation analysis in extended families and unrelated individuals characterized for musical aptitude and creativity in music. PLoS One 2013;8:e56356. Seashore CE, Lewis D, Saetveit JC. Seashore Measures of Musical Talents Manual. 2 nd ed. New York, USA: Psychological Corporation; 1960. Peretz I, Champod AS, Hyde K. Varieties of musical disorders. The montreal battery of evaluation of amusia. Ann N Y Acad Sci 2003;999:58-75. Peretz I, Gosselin N, Tillmann B, Cuddy LL, Gagnon B, Trimmer CG, et al. On-line indentification of congenital amusia. Music Percept 2008;25:331-43. Weinstein ND. Individual differences in reactions to noise: A longitudinal study in a college dormitory. J Appl Psychol 1978;63:458-66. Moreira NM, Bryan ME. Noise annoyance susceptibility. J Sound Vib 1972;21:449-62. Schneider P, Scherg M, Dosch HG, Specht HJ, Gutschalk A, Rupp A. Morphology of Heschl's gyrus reflects enhanced activation in the auditory cortex of musicians. Nat Neurosci 2002;5:688-94. Fujioka T, Trainor LJ, Ross B, Kakigi R, Pantev C. Musical training enhances automatic encoding of melodic contour and interval structure. J Cogn Neurosci 2004;16:1010-21. Tervaniemi M, Just V, Koelsch S, Widmann A, Schröger E. Pitch discrimination accuracy in musicians vs nonmusicians: An event-related potential and behavioral study. Exp Brain Res 2005;161:1-10. Putkinen V, Tervaniemi M, Saarikivi K, Ojala P, Huotilainen M. Enhanced development of auditory change detection in musically trained school-aged children: A longitudinal event-related potential study. Dev Sci 2014;17:282-97. Bidelman GM, Weiss MW, Moreno S, Alain C. Coordinated plasticity in brainstem and auditory cortex contributes to enhanced categorical speech perception in musicians. Eur J Neurosci 2014;40:2662-73. Strait DL, Kraus N, Skoe E, Ashley R. Musical experience and neural efficiency: Effects of training on subcortical processing of vocal expressions of emotion. Eur J Neurosci 2009;29:661-8. Kraus N, Chandrasekaran B. Music training for the development of auditory skills. Nat Rev Neurosci 2010;11:599-605. Lonsdale AJ, North AC. Why do we listen to music? A uses and gratifications analysis. Br J Psychol 2011;102:108-34. Stockfelt O. Adequate modes of listening. In: Schwarz D, Kassabian A, Siegel L, editors. Keeping Score: Music, Disciplinarity, Culture. Charlottesville, VA: University Press of Virginia; 1997. p. 129-46. Belojevic G, Slepcevic V, Jakovljevic B. Mental performance in noise: The role of introversion. J Environ Psychol 2001;21:209-13. Furnham A, Strbac L. Music is as distracting as noise: The differential distraction of background music and noise on the cognitive test performance of introverts and extraverts. Ergonomics 2002;45:203-17. Cassidy G, Macdonald RA. The effect of background music and background noise on the task performance of introverts and extraverts. Psychol Music 2007;35:517-37.